"This gem of a book is nothing less than a tour de force. Kydd's analysis of trust and mistrust is superb, provocative, and enlightening. From it he deduces a grand theory of international relations, a theory that not only challenges the most influential theories in the field but explains much of what is important in international relations. He concludes with a topical discussion of and helpful prescriptions for U.S. foreign policy in the contemporary era. What more can anyone ask of a work of social science?" --Randall L. Schweller, Ohio State University, author of "Deadly Imbalances: Tripolarity and Hitler's Strategy of World Conquest""The main virtues of this very clearly written book are its conceptual clarity and its ability to derive a large number of implications from relatively straightforward models. In addition to elaborating the author's own theory, each case history sheds light on existing debates about the events in question, such as the origins of the Cold War, the nature of America's hegemonic leadership, and the causes of the Cold War's peaceful denouement." 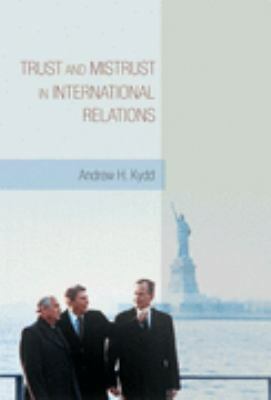 --Kenneth A. Schultz, Stanford University, author of "Democracy and Coercive Diplomacy"Kydd, Andrew H. is the author of 'Trust And Mistrust In International Relations ', published 2007 under ISBN 9780691133881 and ISBN 0691133883. Loading marketplace prices 85 copies from $10.23 How does the rental process work?